We have the best epoxy material systems, expertise and training you need to add Metallic Epoxy systems and Decorative Epoxy Flake systems to your business. Clear epoxy systems and colored concrete coatings with a full palette of colors for vinyl flake materials and colored quartz aggregate products. Metallic Epoxy systems for the unique three-dimensional effects. SureCrete Design Products DK500 is a premium 100% solids clear floor epoxy system. DK500 may be applied alone as clear thick build floor coating for a high gloss shine. DK500 100% Solids Epoxy is also blended with metallic pigments to create unique three dimensional colored coatings. Use DK500 clear 100% solids epoxy as the receive coat for colored quartz broadcast, and as the grout body coat for quartz floors and over decorative vinyl flakes. 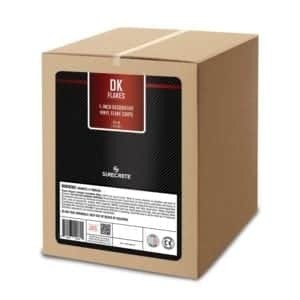 DK500 is available with various hardener systems selected for performance and features. SureCrete Design Products ColorTec 500 100% Solids Colored Epoxy Concrete Floor Coating System is used in a wide variety of applications: as a high-build colored epoxy body coat, as the receive coat for decorative vinyl flakes and as a finish epoxy concrete floor paint. ColorTec 500 is available in over 200 colors using the OnDemand Pigment System from SureCrete Design Products. ColorTec 500 is ideally suited for any commercial or residential setting: manufacturing facilities, warehouses, bars, clubs, retail stores, automotive showrooms, residential interiors, garage floors, gyms, locker rooms, stadiums, or anywhere that an exceedingly resilient floor is desired. 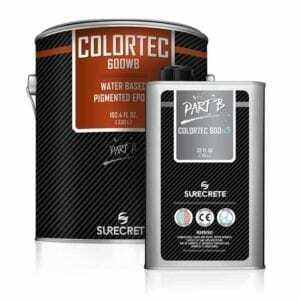 ColorTec 600WB is a waterborne colored epoxy concrete floor coating system which will withstand up to 13 pounds MVER. ColorTec 600WB is used as a two coat solid color concrete floor coating for warehouses, stock rooms, offices, hallways and other high traffic concrete floor locations. ColorTec 600WB provides an excellent receive coat for decorative vinyl flakes in an epoxy flake floor coating system, and can be the solid color base coat under metallic epoxy floor coating systems. The extreme mechanical bond of ColorTec 600WB to concrete eliminates hot tire pickup. DK Metallics are an integral part of a seamless flooring system that provides a unique three-dimensional appearance with suspended reflective pigments. There are 20 standard available metallic epoxy floor color pigments plus additional Special Order colors. DK Metallics are combined with DK500 100% Solids Epoxy to create fantastic three-dimensional illusion over interior floors, countertops and other surfaces. DK Flakes epoxy floor flake chips system creates a vibrant, seamless, resilient surface from plain gray concrete. DK Flakes from SureCrete Design Products are randomly shaped polymer chips, available in 12 color blend options. DK Flake epoxy floor coating systems are used for garage floors, commercial kitchens, locker rooms, sports venues, automotive showrooms, veterinarian clinics, laundromats and other locations that require a durable non-slip floor coating system. Would you like more information on epoxy flake and metallic epoxy systems? We also offer individual crew training in addition to the training classes throughout the year. Call us for more information on epoxy material systems and the epoxy products you need. Additional information on these material system components for epoxy flake, quartz, metallic. Decorative vinyl flakes for garages, hospitals, locker rooms, commercial kitchens. Colored quartz floor materials for high impact resistance and non slip texture. Metallic systems that perform better than Elite Crete Reflector and other competitor systems. DK 500 is a clear floor epoxy 100% solids available in North Carolina and South Carolina a standard, premium, and a thin viscosity options. 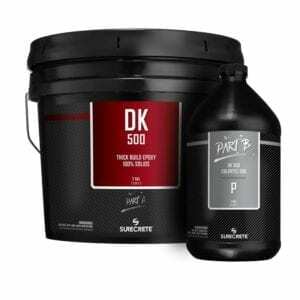 SureCrete Design Products DK500 epoxy coating floor system can be used in a wide variety of applications such as high build clear coat for a host of decorative concrete systems, a primer coat and binder coat for DK Flakes and DK Metallics. The high performance, self-leveling characteristics of DK500 100% solids epoxy generate the premier balance of strength, flexibility, and chemical resistance that is both user-friendly and extremely durable. ColorTec 500 100% Solids Colored Epoxy Concrete Floor Coating System is often used as a single coat system for faster return to service anywhere in North Carolina or South Carolina. SureCrete Design Products Colored Concrete Floor Epoxy OnDemand tinting system the superior pigmented concrete coating system available on the market today. The pigments used by SureCrete’s tinting station are far more durable and UV resistant than typical pigmented concrete sealers. With tints and pigments like these, your finished Colored Concrete Floor Epoxy 100%, epoxy coating system will last much longer than a normal Colored Concrete Floor Epoxy 100% epoxy sealer ever would, with the color staying much more vibrant over a long period of exposure. Not only are the tints more durable and UV-stable than typical colored concrete sealers, but the color range available is also a great deal wider than those available on the market today. Pigmented ColorTec 500 Epoxy 100 is available in more than 200 standard colors and now, with the power of the tinting station, all these colors and more are available same. We can even match your color palette from a different manufacturer such as Sherwin-Williams, Dupont, Baer, Valspar or PPG Paints. SureCrete Design Products ColorTec 600WB Waterborne Colored Concrete Epoxy Floor Coating is a two component 52% solids, low VOC floor coating system that is used throughout North Carolina and South Carolina in a wide variety of applications: durable colored layer for both new and old interior concrete floors, primer coat, and binder for DK Flakes and Metallics. The high loading of SureCrete pigments achieves the preferred substrate hide and color uniformity in over 200 colors. May be applied on fresh concrete as soon as three days after pouring and placing concrete. Excellent open time provides more time for broadcasting media. High solids provides great coverage and low odor. Less than 50 VOC formula and non hazardous. Excellent for use in the Rapid Cast Chip Floor System. Can be tinted with SurfKoat’s Kolour Koat Prime Pack. Fourteen brilliant standard colors to choose from. Effective for creating a base color in the SurfKoat Rapid Cast System. Easily disperses into PolyKoat Prime 100. Decorative Vinyl Flakes are also known as Decorative Vinyl Chips. Systems are referred to as Epoxy Flake or Epoxy Chip. These systems are commonly used in Garages, Bathrooms, Locker Rooms, Kitchens, and other North Carolina and South Carolina locations that require a floor that is chemical and abrasion resistant with excellent non-slip traction. Epoxy Flake or Epoxy Chip systems start with a base coat of pigmented epoxy or pigmented polyaspartic. Most projects will use pigmented epoxy for the epoxy flake or epoxy chip system. Choose SureCrete Design Products ColorTec 600WB Water Base Pigmented Epoxy as the base coat for your flake or chip project. The system forms an extremely strong mechanical bond to concrete to eliminate hot tire pickup in garages, and will withstand high moisture vapor emissions in problem concrete. Metallic pigments that, when combined with DK500 100% Solids Epoxy, produce dramatic three-dimensional effects on floors throughout North Carolina and South Carolina. 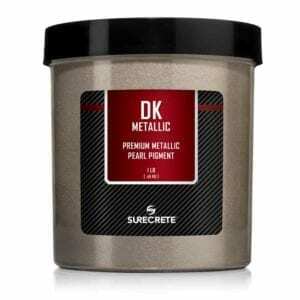 The DK Metallic System is superior to Elite Crete Reflector Enhancer, Metal Fusion, Lava Flow, Pearlescent, and all other manufacturer options. DK500 100% Solids Epoxy stays open longer for superior effects and excellent heal with self-leveling no roller line finishes. The best epoxy systems in North Carolina and South Carolina are available from Turning Point Supply in Charlotte NC and Raleigh NC.